New Year and New Wall Decals Designs! How was your Christmas? And, your New Year? We’ve all had a super-relaxing break here at Vinyl Design … and while our bodies were relaxing our minds were on the go working on a few new vinyl wall decal designs! It was wonderful to come back after the break and see that our gift of a 20% discount had been so much enjoyed! We’ve spent much of our time over the past couple of weeks packing and posting your orders … don’t forget to take photos and tag us on your Instagram! We’ve got two wall decal designs new to the Vinyl Designs range this month and we’re sure you are going to love them! Our reusable chalkboard map of Australia will look just as great in your kid’s bedroom as it will in your own office! Unlike other ‘chalkboards’ on the market our chalkboard doesn’t require any special pens or chalks … your everyday ‘school’ chalk is all you need so you can quickly and easily wipe it down and write again and again! All you need for your chalkboard map of Australia is a clean smooth surface (and it’s perfect for renters because it easily comes off without leaving any residue behind) … you could put it on a wall, the fridge, cupboard, or even a window. If you’re looking to spruce up the walls of an airplane mad little (or big!) 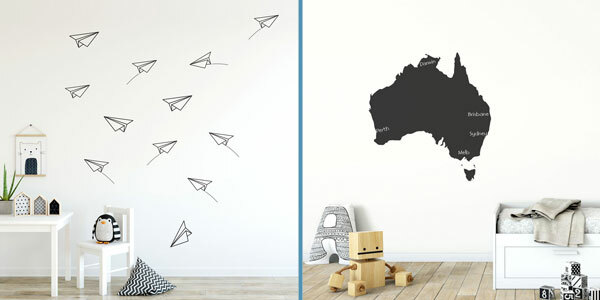 boy or girl you’ll love our new paper planes wall decals! These are available in your choice of our 25 gorgeous decorator colours … how amazing these would look on a dark navy or green office or study wall in our magenta or metallic gold! Each pack has 12 planes in two different sizes and you can position them however you like. Until next month … enjoy the summer holidays (or longer sunny days if you’re back at work like us)!